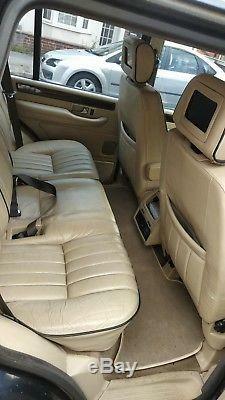 2000 Range Rover 4.0 SE, I have owned this car for 18 months. I think its still one of the best looking 4x4's, it has a road presence that most modern SUV's cant match. It drives well and is very comfortable. The 4.0l V8 sounds lovely and runs smoothly. The car is in good overall condition for its age, but it has a dent/scrape in the front passenger door. There are a few small scratches and small dents over the car its to be expected for its age, 18 years old. Mechanically the car is good the engine doesn't miss a beat, starts up with no problem. Ive had too replace the water pump with a new one, due to the old one leaking. There is a small oil leak but im not sure were its coming from, the drops of oil on the road are well forward from the engine, I think it might be a pipe of the oil cooler but not im sure. One big plus point, the air suspension on this car has been replace with normal coil springs. The car breaks work fine but the rear disk's are wearing thin. One of the rear tyres will need replacing soon due to it wearing close to the limit and the other has a nail in it. Interior is in good condition for the age. Like all P38's the roof lining was sagging so deiced to remove it. The seats are leather and all good and very comfortable however the drivers seat is starting to show a bit of wear but has no rips. There is a problem with the dual climate control the passenger side is stuck on hot. This is a common fault with P38's. The radio is a Sony XES Z50 with 10 disk cd changer in the boot. The system looks like it was professionally installed but the music is only coming out of the front speakers. The amps have the power lights on i think it will need looking at who knows about radios. There are two LCD TV's on the head rests but only one comes on. There is a PS1 that works on the one screen in the back no controllers. The battery might need replacing as it keeps on going flat, i only use the car once or twice a week for short journeys so i dont think that helps. Ive listed the last advisory on its MOT. Nearside Front Direction indicator slightly discoloured 1.4. Rear Brake pad(s) wearing thin (3.5.1g). Nearside Rear Brake pipe slightly corroded 3.6. Offside Rear Brake pipe slightly corroded 3.6. Nearside Front Suspension arm rubber bush deteriorated but not resulting in excessive movement front and rear bush 2.4. Offside Front Suspension arm rubber bush deteriorated but not resulting in excessive movement front and rear bush 2.4. Offside Front Anti-roll bar linkage has slight play in a ball joint 2.4. Offside Front suspension has slight play in a upper suspension ball joint 2.5. Offside Front suspension has slight play in a lower suspension ball joint 2.5. Offside Rear Tyre worn close to the legal limit 4.1. Nearside Rear Nail in tyre. Power steering pipe(s) or hose(s) has slight seepage from a joint (2.3.3b). The price is fair, so please no silly offers. Feel free to contact me with any questions im working all week but ill try and respond as quickly as possible. The item "Range Rover 4.0L SE 2000 P38" is in sale since Monday, July 9, 2018. This item is in the category "Cars, Motorcycles & Vehicles\Cars\Land Rover/Range Rover". The seller is "thefistsoffury" and is located in Eastleigh.